A nother successful “Pilates for Golf” – “Pilates for Golfers” class this morning just outside of South Dublin in Enniskerry for a group of guys who want to improve their (1) Core Strength, (2) Mobility and (3) Flexibility to up their Golf Game! 1. Pilates Rings to boost Core Strength and Increase Flexibility. 2. Resistance-Bands (sometimes also called Power-Bands) to work on general strength and once more Core Strength. We went through the following Partner Exercises with the Resistance-Bands. to keep they Golfers challenged and interested. Let me know if you have any questions in relation to those Resistance-Band exercises. 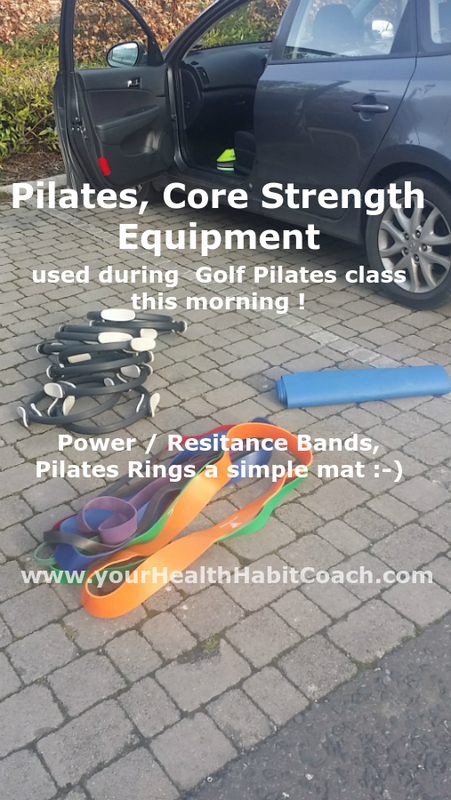 This entry was posted in Fitness Equipment, Sports Pilates and tagged Core Strength for Golf, Fitness Pilates, Golf Pilates, in Enniskerry, in South Dublin, Pilates Circles, Pilates Rings, Pilates with Martin, Power Bands, Resistance Bands on January 30, 2018 by admini.